Southern Italy Journey GIVEAWAY: Positano, Ravello, Amalfi and Capri. Winner receives 1 journey pass. To redeem, winner must purchase 1 pass at our regular price of $3,681 + airfare. Details below! A unique and intimate journey through the spectacular Amalfi Coast towns of Positano, Ravello, Amalfi and the magical island of Capri! Pictures are a useless attempt to capture the beauty of this region. The Amalfi coast and the island of Capri are world renowned and have been a sought after travel destination since Roman times. No matter where you turn, the views are spellbinding, the history is rich and the food unforgettable. The people of southern Italy are warm and welcoming, their unique cooking style and local wines reflect the same amiability. Request the itinerary for complete details! We’ll send you the detailed itinerary for this journey ASAP! Day 1: Welcome to the Amalfi Coast! Join us in the hilltop hamlet of Nocelle and settle into your family run B&B (a converted farm house) before exploring this peaceful little village. We’ll enjoy a house-made dinner served on a terrace overlooking the Amalfi Coast this evening. Day 2: Embark on a private walking tour of Ravello this morning! You’ll be treated to an insider’s look of Ravello’s historic villas, gardens and magnificent Duomo. Explore the many alleys and beautiful beaches of Positano. Return to Nocelle for another amazing dinner of typical southern Italy specialties. Day 3: This morning we hike the “Path of the gods”, one of the 10 best walks in the world! Visit Amalfi for an unforgettable lunch at one of my favorite farm-to-table agriturismo. From here, explore the historic, bustling seaside village of Amalfi! Day 4: This morning we’ll depart for the island of Capri! Explore the more authentic part of the island - Anacapri. Experience authentic Caprese dishes created using goods directly from the island. Discover historic Villa San Michele, take the chair lift up to Monte Solaro (the island’s highest point, with the best view). Day 5: This morning we’ll explore the eastern part of the island including the world famous Piazetta, Natural Arch, Grotta Matermania and Augustus Gardens. This afternoon we’ll embark on a private boat tour around the island! We’ll explore (and swim if you’d like) in some of the hidden grottos. Participate in an authentic Caprese cooking class and taste local wines for dinner! Day 6: We’ll depart Capri for Naples this morning and bid farewell until next time! General: The announced contest winner will receive one free pass for this journey. The contest winner is not chosen by Sojourn Italy, LLC. To redeem the free journey pass, the contest winner must purchase at least one journey pass (for the journey outlined in the detailed itinerary) at our regular price of $3,681 per person. Only one free journey pass will be awarded regardless of the quantity of additional passes purchased. This journey has a guest limit of 5 guests maximum. Final journey dates must be chosen within 30 days after the winner has been announced. The required purchase of one journey pass, or minimum deposit of $400, must also be made within 30 days after the winner has been announced. Journey availability is limited to Jun 13th-30th or Oct 18th-30th 2020. Final journey dates are at the full discretion of Sojourn Italy, LLC. What’s not Included: Airfare, activities, transportation and meals not listed in the detailed itinerary. Travel Protection and Insurance are not included. 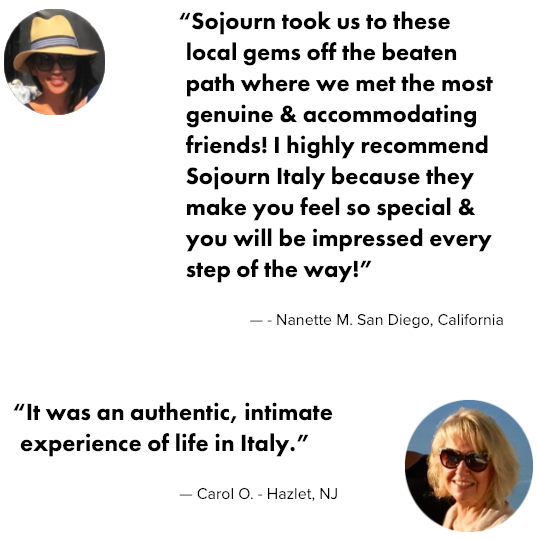 Request the detailed itinerary by sending an email to anthony@sojournitaly.com or calling 718-446-8242. This Travel Experience: This journey has a maximum number of only 5 guests so you may be traveling with others! Accommodations: Journey pass includes one double room with one queen size bed or two twin size beds in small, boutique B&Bs. A single supplement will apply if you require an additional room. Meals: Travelers must make Sojourn Italy aware of any dietary restrictions and allergies 96 days prior to departure. 11 outstanding meals are included on this journey. All included meals are listed in the detailed itinerary. Cancellation / Transfer Policy: You may transfer your winnings to another individual with the consent of Sojourn Italy, LLC. Transfer of winnings must be made within 30 days of the winner being announced. Deposits for journeys are 100% refundable for 30 days from the date they are received. After 30 days your deposit becomes non-refundable, and will be forfeited should you decide to cancel your reservation. Cancellation Fees: 96+ days prior to trip start - $200 per person (including the contest winner). 61-95 days prior to trip start - 30% per person (including the contest winner). 31-60 days prior to trip start - 60% per person (including the contest winner). 0-30 days prior to trip start - 100% per person (including the contest winner). If you must cancel your reservation, your cancellation fee will be determined according to the policy outlined below. Exceptions to our cancellation policy cannot be made for any reason, including weather, terrorism, civil unrest or personal emergencies. There is no refund for arriving late or leaving a trip early. Percentage charges are calculated on the total trip cost, including the value of the contest winner’s free journey pass. Cancellations must be in writing: sent via email to anthony@sojournitaly.com. Cancellations become effective on the date received by Sojourn Italy. You may transfer from one date to another, for this journey only, up to 96 days before the trip departure without penalty, after which time our cancellation policy applies. New journey dates are subject to the availability and full discretion of Sojourn Italy, LLC. When transferring to a new date or trip, if the new trip costs more than the original trip, you must pay the difference in cost. Your transfer request must be approved by Sojourn Italy, LLC. All guests will be required to sign a travel waiver before departure. PASSPORT REQUIRED FOR ALL GUESTS—INCLUDING CHILDREN—TRAVELING OUTSIDE THEIR HOME COUNTRY. MOST COUNTRIES REQUIRE THAT YOUR PASSPORT BE VALID AT LEAST 6 MONTHS BEYOND YOUR TRIP DATES.